As a chain invokes the image of a direct connection between its constituents, we will focus our attention on creating an environment where everything is a badge. There is a legitimate reason to use badges for everything: once we understand that a badge is a relationship (between an issuer and an earner), saying everything is a badge is not different from saying everything is relationships. Making everything a badge should make it as easy to play with them as it would be with Lego™ blocks. if you insist on building something with them, do not sneeze, or you’ll have to restart from scratch! The next Open Badge standard should bring us closer to the conditions for Lego™ block-like badges, with matching tubes and studs. This should open the Open Badge ecosystem for some serious and rich play to take place (*). 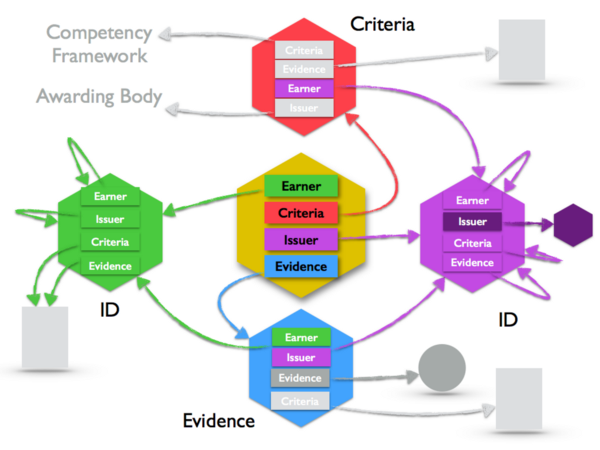 In a world where everything is a badge, we could use badges for many different purposes: creating personal identifiers, linking to evidence, setting criteria for issuing or receiving a badge, etc. Some of these options are described in the table below. In the picture above, the arrows elicit the links between the components of a badge. The green and purple badges are identifiers with the green badge being self-issued (self-referential). The Issuer of the yellow badge at the centre is the purple badge so the content of the Issuer metadata of the yellow badge contains the address of the purple badge. The Evidence metadata links to a blue badge that was issued by the issuer identified by the purple badge — it could be an observation of the learner’s performance, and the Evidence of the blue badge could be a video of the observation and the Criteria the narrative of the observation by the issuer. There are probably better ways to connect badges together, but what we want at this point is not to decide on what is the best possible way to connect badges together but to explore the properties of chaining badges together: what are the properties of chained badges that badges placed in a bag do not have? Chained badges change the topography of the Open Badge landscape where issuers are currently at the summit of their Open Badge dominions. Chained badges are a means to put an end to the strong asymmetry between issuers and earners implemented in the original version of the Open Badge Infrastructure — surreptitiously underpinned by the formal education credentialing model. By connecting badges together, we are creating interwoven threads of data, so starting from one person’s identifier in the network we are able to follow multiple paths that connect this person to all the other participants in the network, their relationships, knowledge and the artefacts produced. Chained badges create one global distributed database from where one can pull different threads, creating multiple narratives, from different points of view: individual, community, organisational, city and region. Moreover, when looking at the picture above, we are looking at something that might speak to the ePortfolio practitioner. By connecting together pieces of information we are creating meaning and assembling the elements of a new artefact: a portfolio. Most of us are familiar with the action verbs associated with ePortfolios: collect, select, connect, reflect — BTW, those verbs do not describe a “sequence” as the collection could be the result of a reflection and conversely! Open Badges are a means to simultaneously collect and connect, while creating meaning providing the fuel for further reflection (and action!). 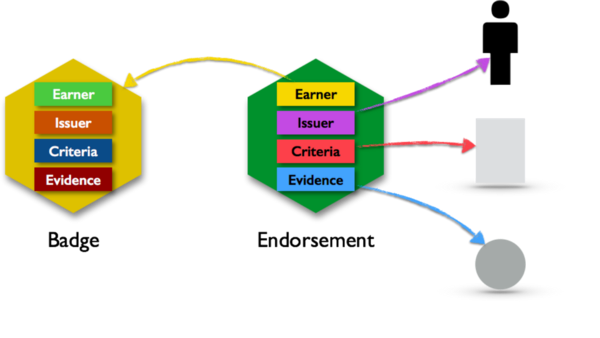 My proposal is that Open Badges and ePortfolios are not “complementary” objects, but Open Badges are the substratum from which ePortfolios grow organically, like a beehive out of the activity of the bees — bee-badges for hive-portfolios! By providing a space where everything is a badge, we have also resolved the issue of interoperability: we render obsolete standards like IMS ePortfolio (hardly used) and LEAP2A (slightly more used) that are based on a fragmented vision of information systems, in particular the storage of data, something that is now challenged with the increased adoption of distributed ledgers (blockchains).